Released by F.O.A.D. Records in 2012. DLP, Die-hard splatter edition in clear vinyl with orange/black speckles, ltd to 100 & 400 as black vinyl edition, housed in a high-glossy laminated gatefold cover including unreleased photos and exclusive liner notes. C3 - Fall To Hell! C7 - Ronald Reagan F.O.A.D.! If one talks about classic Swiss Thrash Metal of the 80s, EXCRUCIATION is hands down the missing link to complete the unholy trio that forged the genre.. easy to realize that the other 2 are HELLHAMMER and MESSIAH. This special edition double LP is a deadly restrospective nightmare into the band's rawest and earliest recording. 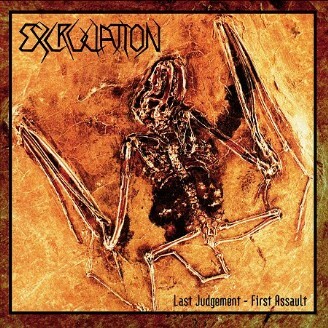 It starts with an incredibly remastered version of the classic "Last judgement" Mini LP originally released in 1987 by the obscure kult label CHAINSAW MURDER RECORDS (that in its short existence brought to vinyl MESSIAH and a legendary 7" of Chile's Death/Thrashers PENTAGRAM!) and then you get the entire "First assault" Demo 1986 plus an extensive selection of rare rehearsal and live tracks from 1985 to 1987 reaching a total of 25 bursts of mayhemic Thrash. The stuff here ranges from riff oriented Thrash the evil school (think of early DESTRUCTION and once again, MESSIAH) to faster Thrash close to the "core" formula (on the backcover you'll see them in D.R.I., C.O.C. and WEHRMACHT tshirts) to some darker slow paced structures recalling the crypts of Tom G. Warrior's bands.. what you get here is not only meant to be an extended version of the band's cult MLP "Last judgement" but basically a complete tour revealing the roots of their sound, the sound of one of Switzerland's most incredible Metal acts.